$199 Fast results for 1) EMSA, 2) Competitive EMSA, 3)Supershift EMSA. $159 For 1) EMSA, 2) Competitive EMSA, 3) Supershift EMSA, 4 ) purification of binding proteins. NF-кB was determined to have DNA binding activity with the enhancer of к-chain of immunoglobulin in B cells and was discovered in the cytoplasm of other cell types. It forms complexes of NF-кB/I-кB. The classical NF-кB is a heterodimer composed of a 50-kd (p50) and a 65-kd (p65 or RelA) subunits. Other members of the mammalian Rel family include p75 (c-Rel), p49 (p52) and p78 (RelB). The p65, p68 and p75 subunits have high transactivation activity, and the p50 and p49 have relative low transactivation activity, although they all can bind to DNA. Some studies have suggested that p49 and p65 may also form a heterodimer with transcriptional activity. The heterodimer of p49 and p65 is similar to that of p50 and p65. An inhibitor IKBα/MAD-3 in the cytoplasm controls the heterodimerization of p49/p65 and p50/p65. The complex of IкB/p65 inhibits the transcriptional activity of NFкB in the nucleus. In vitro, high concentrations of p65 can form homodimers that can bind DNA slightly, which can be inhibited by Poly(dI:dC). P49 and p50 also can form small quantities of their homodimers in cells. In typical NF-кB EMSA experiments, the 20ul reaction system contains 10 mM HEPES, 0.28pM NF-кB oligonucleotides, 50mM KCl, 0.2mM EDTA, 1.5mM DTT, 10% Glycerol, 0.05% NP-40. 250-300ng of nuclear proteins and 10μg of HeLa nuclear extracts are enough to form complexes that must be kept at RT for 30 minutes and separated in 7%polyacrylamide that contains 50mM Tris (pH8.3) and 38mM Glycerol. The loading buffer that contains Coomassie Brilliant Blue G250 and Xylene Cyanol FF must be add to the negative control system. Coomassie Brilliant Blue G250 and Xylene Cyanol FF can break down the structure of complexes of NF-кB in reaction. It can form two kinds of sequence-specific compounds that are homodimers of p50/p50 and heterodimers of p50/ p65 when HeLa nuclear extracts are used instead of purified nuclear proteins. Four distinct complexes (p49/ p49，p50/ p50，p50/ p65，p49/ p65) can be detected in cells that are expressing p49, p50 and p65. If the concentration of p65 is high in cells, you may detect some p65/p65 homodimers. GTP，ATP，Agmatin, Spermidine, Ba2+, Ca2+, Co3+(NH3)6 all may enhance the binding capability of NF-кB. References：1) Urban MB et al 1991 EMBO J 10:1817. 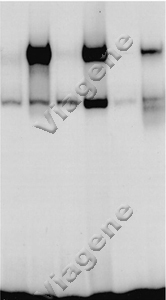 2) Baeuerle PA 1991 Biochim Biophys Acta 1072:63.